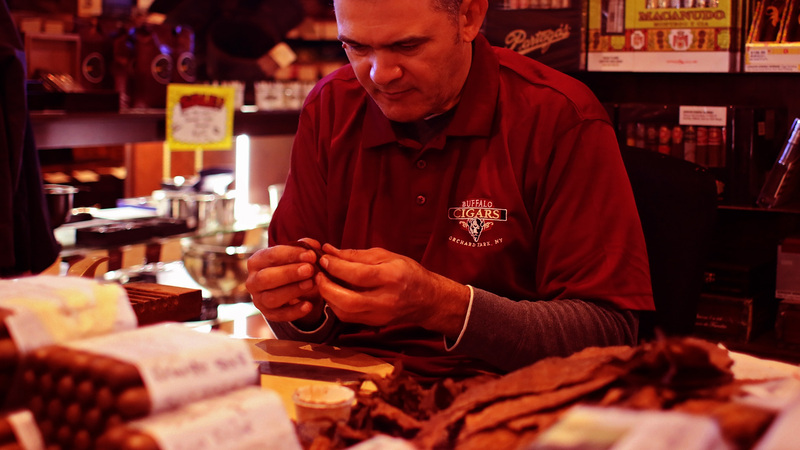 MEET OUR FULL-TIME MASTER CIGAR ROLLER! Our Cigar Roller rotates various days and nights between our stores. He is also available for private functions (parties, bachelor parties, weddings, etc.). Hire Our Cigar Roller For Your Event! Nicolas began rolling cigars at the age of 16 in his homeland of the Dominican Republic and during his almost 40 years of cigar rolling has worked for some of the most well-respected cigar manufacturers in the world, including La Flor Dominicana & Tabacalera del Norte. After moving to the United States, he continued to work as a master cigar roller in between his time as Class A baseball player in North Carolina and a year of professional baseball in Columbia. Nicolas traveled all over the country, working at Little Cigar Factory in Long Island, Portes Cigars in NYC, La Casa Grande Cigars in the Bronx and spent over 11 years at the Cigar Factory New Orleans. He now resides in Orchard Park and works full time for Buffalo Cigars. His hand-rolled Los Martinez cigars are some of the best you will ever smoke, no question about it! Looking for our cigar roller services for your next event?